Since 2009, waste pickers from around the world have participated in several United Nations Climate Change Conventions (UNFCCC). In those events they’ve raised their voices demanding respect and recognition for their role in climate change mitigation. 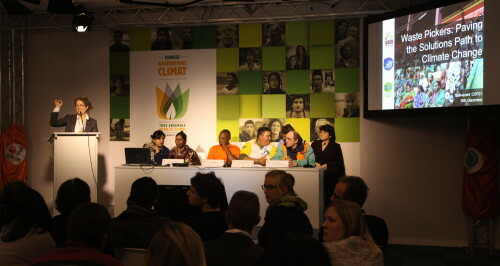 At the last COP21 in Paris, a panel organized by Zero Waste Europe GAIA and Zero Waste France, brought together waste picker leaders from four continents: America, Asia, Africa and Europe. The goal was to share the experiences of waste pickers from all over the world, to show that waste reduction, reduce, recycling and prevention are answers to climate change: Waste pickers: Paving solutions path to climate change. Waste picker leaders from Brazil, Colombia, India, South Africa and France formed a great panel in a packed room, that engaged with the speakers in a long debate session. The videos of the panel are available on YouTube. Supriya Bhadakwad (KKPKP, SWaCH) and Pratibha Sharma (GAIA). India. [Link to video]. Khonkun Hamid (Safain Sena) and Imran Khan (CHINTAN). India. [Link to video]. Simon Mbata (SAWPA, South African Waste Pickers Association). South Africa. [Link to video]. Nohra Padilla (ARB, Recyclers Alliance of Bogota). Colombia. [Link to video]. Patric (Amelior). France. [Link to video]. Severino Lima Junio (MNCR: National Movement of Waste Pickers in Brazil). Brazil. [Link to video]. Laila Iskandar. [Link to video]. Moderation: Mariel Vilella (Zero Waste Europe GAIA). Recorded at the COP21 in Paris on December 10th, 2015.